UFC 226 was supposed to be the most stacked card of the year with multiple action-packed fights. But it suffered a major setback as featherweight champ Max Holloway had to pull out of his title defense against Brian Ortega due to medical reasons. Holloway has been struggling with concussion-like symptoms, which caused him to be admitted to a local hospital on Monday night. His condition worsened so he had to be pulled out of the fight. UFC 226 suffered its first setback when Yancy Medeiros had to pull out due to a broken rib. Paul Felder was brought in as replacement from lightweight as he was also left without an opponent. His scheduled opponent James Vick was brought in as replacement for Al Iaquinta against Justin Gaethje for UFC Fight Night Lincoln. Due to Max Holloway‘s pullout, the fight has been scratched and it has been confirmed that the co-main event will now feature Derrick Lewis vs Francis Ngannou . Also, “Platinum” Perry vs Paul Felder has been promoted to the main card. In addition to that, a planned UFC Fight Pass preliminary bout has now been bumped up to the FOX Sports 1 portion of the undercard. That bout is Lando Vannata vs. Drakkar Klose. Even though, Holloway pulling out is a blow to the fight fans, UFC 226 can still boast of some really great fights. Derrick Lewis vs Francis Ngannou is a barn-burner as both these knockout artists will try to get their hand on the number one contender position. 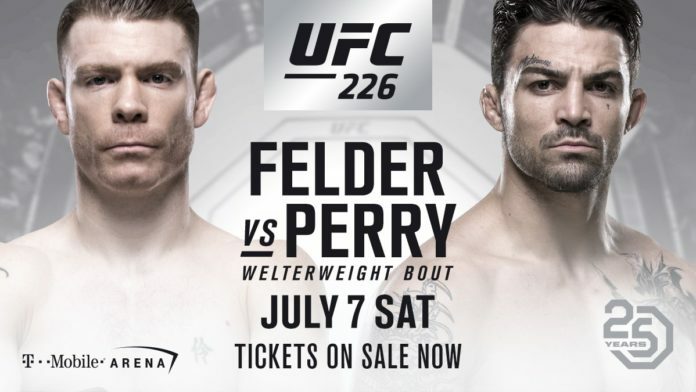 Felder vs. Perry is also an exciting fight as Paul Felder moves up a division to face Mike Perry. Perry is on a two-fight losing streak and would like to improve his record. Felder on the other hand is on a roll with three very dominant victories in the lightweight division and it remains to be seen how he fares at welterweight. Let us know your predictions for UFC 226 in the comments below.